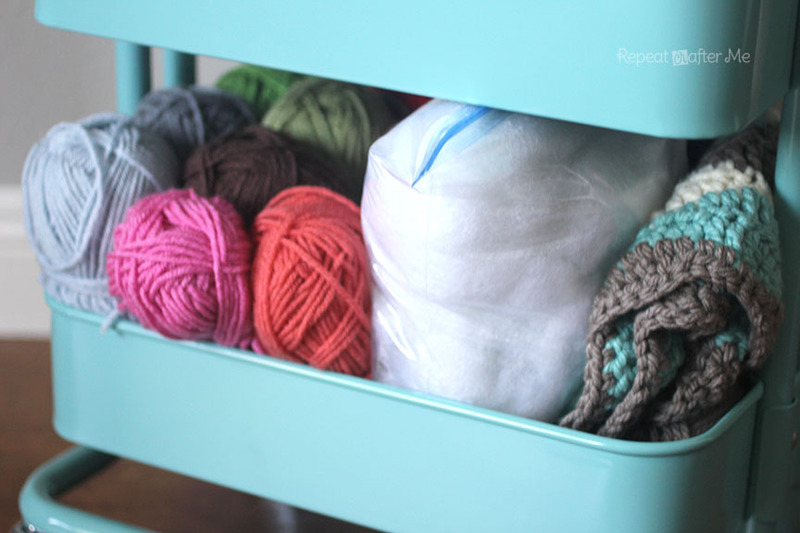 The Ikea RASKOG Utility Cart is a crafters best friend! This 3 shelf cart is propped up on wheels making it easy for you to move and also perfect for tight spaces. So many options for storage as well. I’ve seen it used as a kids art cart, makeup station, kitchen caddy, bookshelf, nightstand, and more. But I had my eye on it for one thing: YARN! 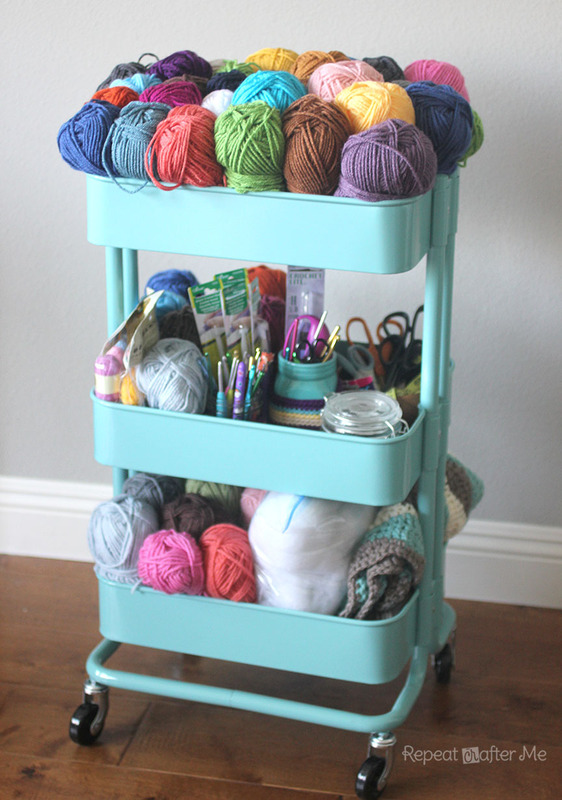 I finally bit the bullet and purchased the utility cart, then immediately started stuffing it with yarn and crochet tools! I am using the top for a wide variety of open/used skeins. I love that I can see all the colors and can easily grab whichever one I need. 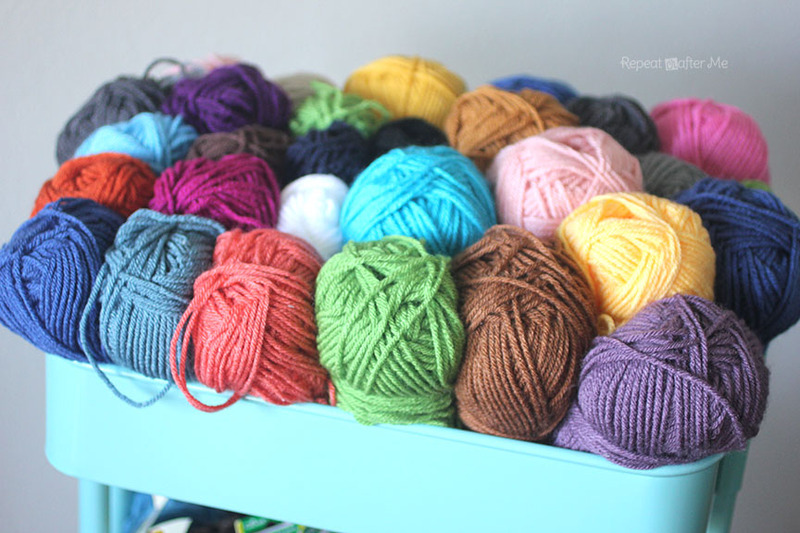 This is much better than having all my working yarn jumbled together in a big basket. 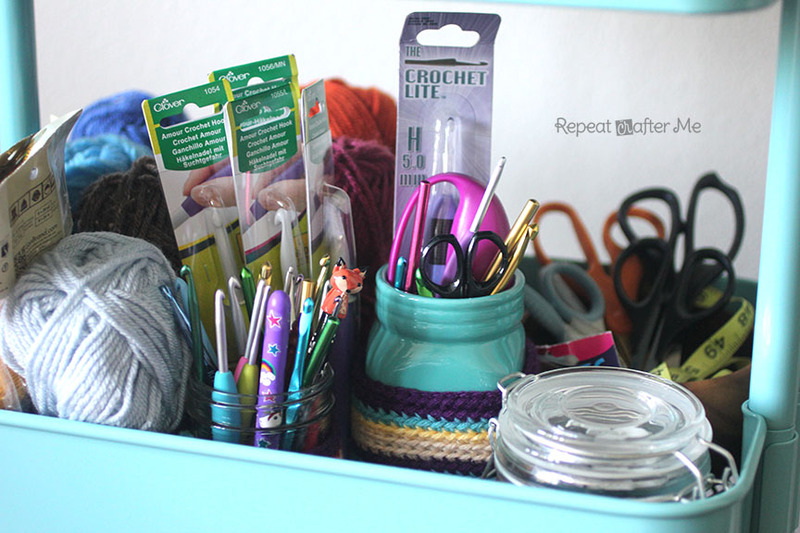 The middle bin has my hooks and other essentials like scissors, measuring tape, buttons, skip stitch blade, safety eyes, yarn bowl, etc. The center bin is adjustable! 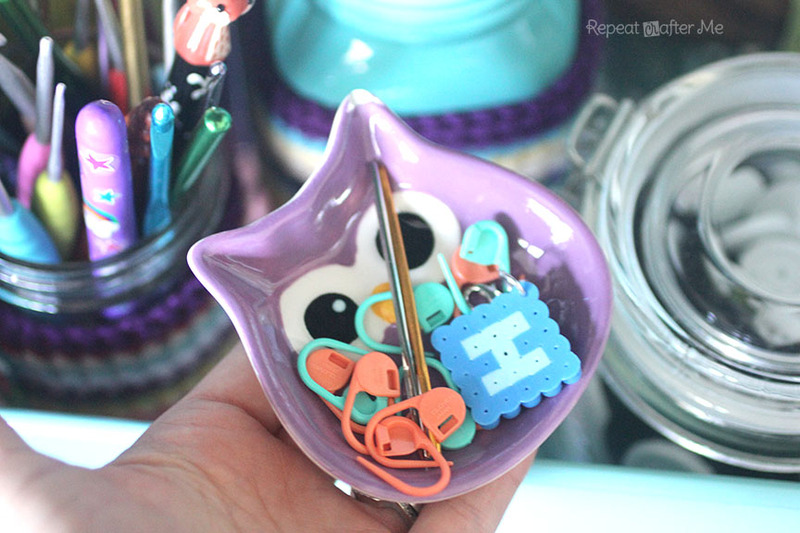 Even a small tray for my stitch markers and tapestry needles! The bottom is perfect for holding a few WIPs (Works In Progress), poly-fil stuffing, and more yarn! I am thrilled with my new crochet cart! Convenient, accessible, and organized! This is my side of the bed 🙂 It’s a yarn haven! With 3 kids ages 6,4, and 2, I am usually only able to get crochet time when they go to sleep. As they get older I may be able to wheel this baby next to the couch or office nook. You can purchase the Ikea RASKOG Utility Cart at Ikea stores for $29.99. You can purchase it on Ikea.com for $29.99 + $10 shipping. You can also get it on Amazon (free shipping) but it is slightly more expensive there… but maybe you have a gift card? Maybe Ikea is too tempting and if you went into the store you would walk away with way more than $30 worth of merchandise LOL! It’s available in turquoise, beige, and dark grey. OMG! 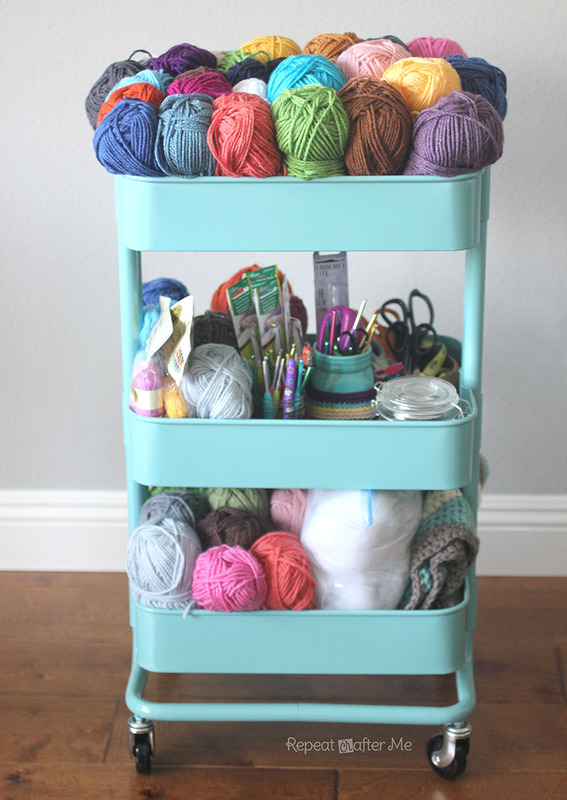 I love this cart and the idea of using it to hold yarn! So… I just ordered one! I can't wait for it to get here!!! I actually bought it too for my painting accessories. Looks great. 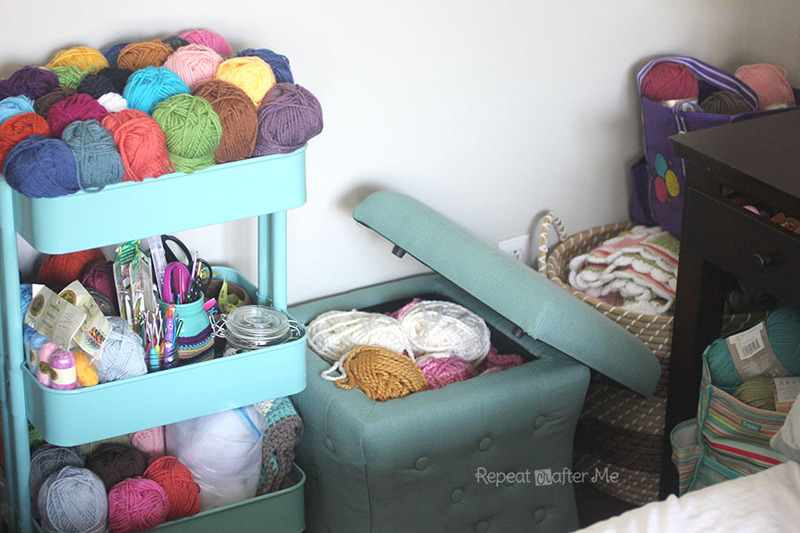 I ditched my sewing table and purchased one of these carts. I love it! It holds all my sewing stuff and now I just sew on the kitchen table and roll out the cart. I've been doing the KonMari method on our house, less stuff and more baseboards, that's my goal. This little cart did the trick! 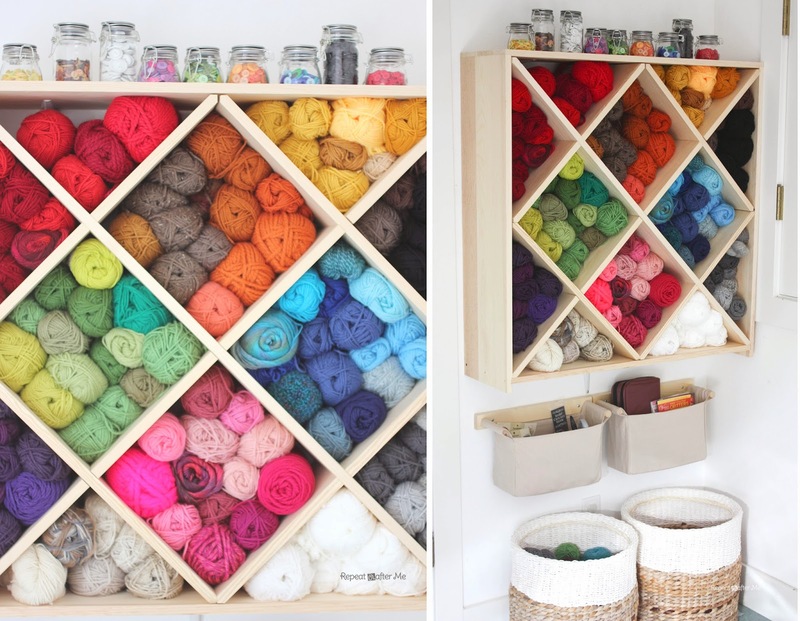 This cart seems to small for me, but I love your yarn storage system. Your side of bed looks like mine but way better organized. 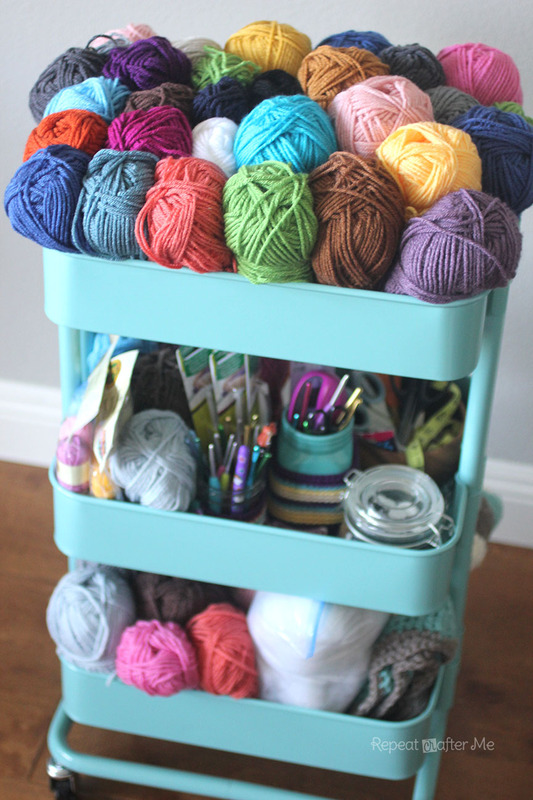 Love the cart with all that colorful yarn! I've been thinking about this for knitting for some time, now I am going to get one!!!! Ditto!!!! I love the cart I was wondering where did she get it and you posted it thank you! I thought my side of the bed looked like that, LOL good to know I’m not the only one. I love this cart!!! I crochet, embroidery, knit and quilt. This would really come in handy. Thank you for the link..
Looks like such a lovely idea, 29.99 us dollars converts to 19. 43 british pounds , yes ! that wont break the bank i think. So i look at the english ikea site, 50.00 british pounds which is 77.18 us dollars. Ah well , keep looking . This cart is always at Michaels. Every day value $30.